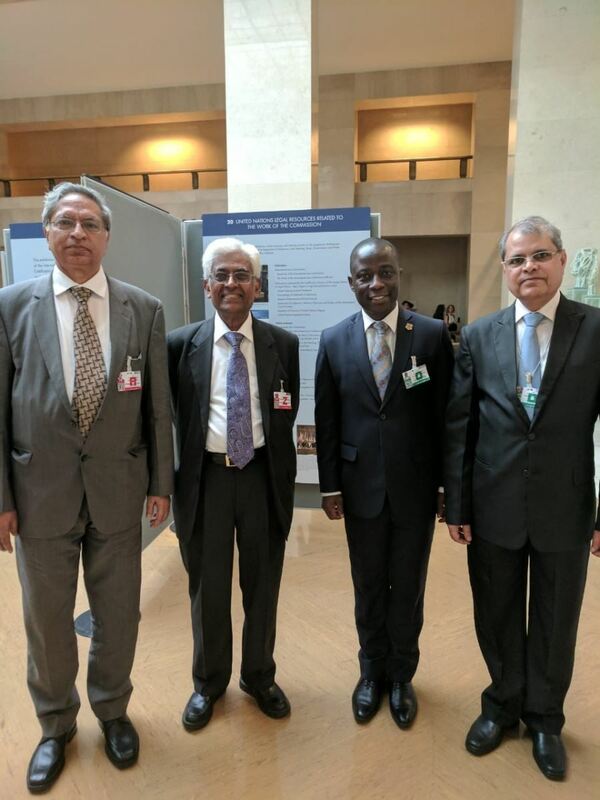 The Secretary General attended the Commemoration of the Seventieth Anniversary of the International Law Commission on 5-6 July 2018 in Geneva, Switzerland. The theme of this session was “70 years of the International Law Commission: Drawing a balance for the future”. There were four sessions spread over 2 days of the special session. First panel on “The Commission and its impact” focused on What happens to the final products of the international law commission? What has been the impact of the commission’s work on State Practice, including court decisions and legal scholarship? To what extent does the form of the work of the commission affect its impact? Second panel on “The working methods of the Commission” and focused on should the commission adapt its working methods to the outcomes of its work? How has the communication with the other bodies and persons changed and how could it be improved? The role of special rapporteurs; the role of the drafting committee; the role of commentaries; the role of the codification division; and other support. Third panel on “The function of the Commission: How much identifying existing law, how much proposing new law?” and dealt with several issues such as the need for ‘international law commission’ – then (and now? ); then it is true that the distinction between progressive development and codification is usually difficult to maintain? Or are there topics where this distinction should be emphasized in the work of the commission? Should the commission emphasize the consolidation of existing law, or should it emphasize the development of the new law? Fourth panel on “The changing landscape of international law” focused on the commission and the development of international law: and assessment after 70 years; what topics should the commission take up next? Should the methods of the commission to select its topics be reconsidered? What role can states play in the identification of topics? The last panel on “The authority and the membership of the Commission in the future” focused on the how is the commission and the outcome of its work perceived by Governments, courts and other international law making bodies and processes? Does the relationship with the 6th committee need to be improved? Are the different legal traditions, regional origins, and professions of its members influencing the work of the commission? How to attain gender parity, and perhaps other forms of diversity, such as generational diversity? What are the possibilities and the pitfalls for the commission in the decade to come?